In China, power generation growth has increased national dependence on coal for meeting a large portion of power needs and has in turn driven regulations surrounding environmental controls and water treatment. Regulation of power plant wastewater discharge, to the level of zero liquid discharge (ZLD) for streams such as the wastewater from coal power plant flue gas desulfurization (FGD) and blowdown from recirculating cooling systems, has become the norm. Amid these new stringent discharge and water reuse requirements, the Huaneng Group, China’s largest power producer, finalized plans for the construction of a state-of-the-art ultra-supercritical coal fired power plant at the Changxing Power Station in Zhejiang Province, approximately three hours southwest of Shanghai. A new wastewater treatment plant was included for treatment of a combined waste stream, including the FGD blowdown wastewater stream and cooling tower blowdown. In order to meet water intake and discharge limits the new water plant would be designed for ZLD and complete liquid recovery for reuse as boiler makeup water. After reviewing various project proposals, Changxing Power Plant selected Oasys Water and its Chinese partner, Beijing Woteer, to deliver the world’s first commercial application of Forward Osmosis-based ZLD, an innovative desalination method that Oasys Water has pioneered. Oasys Water has provided its Membrane Brine Concentrator (MBC) system and pre-concentrating reverse osmosis (RO) while Beijing Woteer supplied physic-chemical, filtration and ion exchange pretreatment. The guiding philosophy in designing the ZLD process flow for Changxing was for the pretreatment and MBC sections of the system to be able to absorb the wide swings in wastewater flow and water quality arising from variations in the FGD scrubber process. 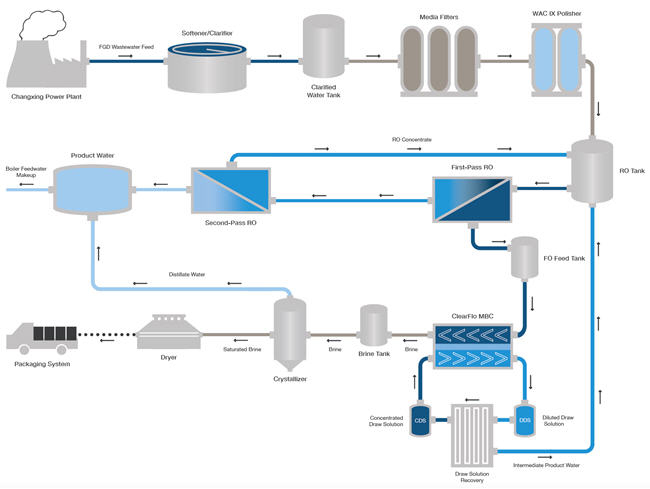 Because the wastewater treatment plant was built with the new facility and not a retrofit, the ZLD process flow was designed based on projected water quality data. Ability to treat a variety of waters across a wide range of hardness, alkalinity and total dissolved solids (TDS) was therefore planned for in the design of the system. Complete softening of the FGD wastewater was required due to the high concentration factor required for ZLD, in order to minimize opportunities for scaling in pre-concentrating RO system and for premature saturation of minerals in the crystallizer. Stoichiometric softening in a contact clarifier was combined with weak acid cation (WAC) ion exchange polishing. MBC process flexibility was maximized so that the wide range of feed flow and water quality could be managed. To accomplish this, the team defined four design cases for flow and incoming TDS. The RO and FO components of the MBC were then design to produce stable brine TDS, allowing flow and overall recovery to float as necessary. To maximize turndown ratio the FO component of the MBC was split into three trains. This configuration allows operation of the MBC at flows from 60% to 110% of design maximum. Operating with a shared draw solution recovery system, the FO section of the MBC is laid out as three parallel trains where any configuration of the trains may be in service at one time. The FO MBC concentrates wastewater dissolved solids from approximately 60,000 mg/L in the RO concentrate to 220,000 mg/L or higher. The MBC does the brine concentration work of a thermal or mechanical evaporator with the simplicity and modularity of a membrane system. The FO trains are driven by an osmotic pressure gradient created across a semi-permeable membrane to achieve spontaneous and preferential diffusion of water molecules from a saline feed into a proprietary draw solution. As water crosses the FO membrane it dilutes the draw solution. At the draw solution exit of the FO array it has extracted the prescribed amount of clean water from the wastewater stream and a separation process must be performed to reconcentrate the draw solution and to separate the clean water stream for reuse. To reconcentrate the draw solution it must be heated to between 45 °C and 65°C above the inlet dilute draw solution temperature, to volatilize and subsequently recondense and absorb NH3 and CO2. For the Changxing system the energy requirement is typically 90 kWht per m3 of wastewater processed while the draw solution recovery was designed to use steam as the energy source for volatilization and water cooling for condensation. The fresh water stream exiting the MBC draw solution recovery loop combines with the pretreated wastewater stream and passes through the RO system. It leaves the system in the second pass RO permeate stream with TDS <100 mg/L, is stored in the product water tank, and is reused in the power plant’s boiler makeup water system. The MBC system is designed to recover up to 23 m3/hr, or up to 87% recovery. Concentrated brine exiting the MBC system feeds a two-stage crystallizer at a target TDS concentration of 220,000 mg/L or higher. Currently, the crystallizer processes 2.5m3/hr of brine, operates at pH 8.0 – 8.5 and concentrates the brine to saturation. A pusher centrifuge and hot air dryer system remove remaining water to <0.5% and produced mixed salt crystals of >95% NaCl + Na2SO4 which are bagged and palletized for sale to chemical manufacturers in the region. Oasys’ patented technology is desalinating the coal-fired power plant’s wastewater from FGD for reuse in the boiler feedwater loop. The wastewater treatment system is now transforming 630 m3/day of the abused FGD wastewater at Changxing Power Plant, to reduce both intake of local surface water and outflow of industrial wastewater. This project allowed Oasys to introduce an innovative FO based brine concentration and water reuse process to treat desulfurization wastewater while also serving as a reference for other power producers in China as water and environmental regulations continue to mount. Originally written by Oasys Water and published August 20, 2015 by Water Online.